Rob Gonsalves is a Canadian painter of magic realism illusions. I couldn’t find Rob’s homepage, so if you know what’s the adress, be sure to post it under comments. I included a set of 36 pictures Rob Gonsalves produced, and you can see all of them if you jump inside this post. I would appreciate if you commented which of these you find most beautiful and puzzling? Prev Young Lady or An Old Hag ?! Any idea where we can get Hi-res versions so i can use one as my wallpaper?! Rob whatsisname is freakin awesome! his stuff is cooler than m.c.escher’s. 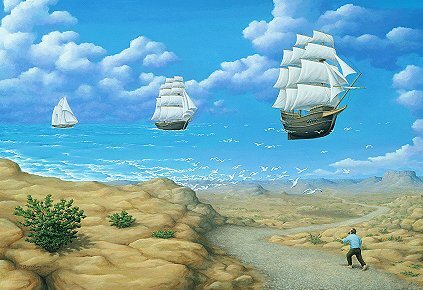 Those paintings are something out of comomm! They transmit us peace and hapiness. Forgive-me for my english, I`m portuguese. 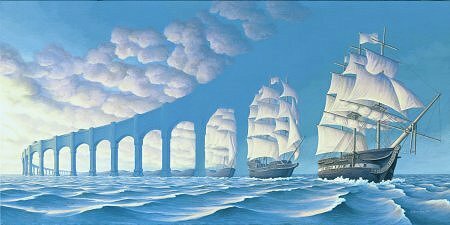 My favorite is the bridge ship. I also like the couch floating in the ocean. 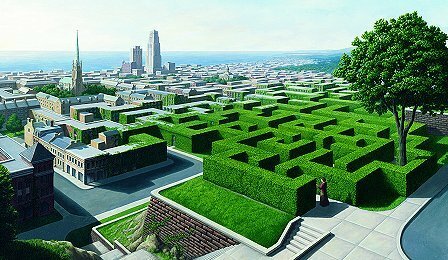 Thats the way I feel somedays :) and the one you put on the post,The green maze. Being a mother, I think I like the ones with children best: the map, the jigsaw, the swing, the bouncing on the bed. They seem to have more content, rather than just being clever. 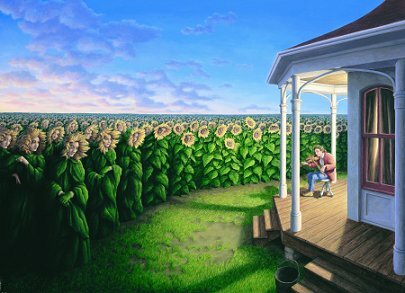 Overall I think his stuff owes a lot to Magritte. They’re all outstanding! 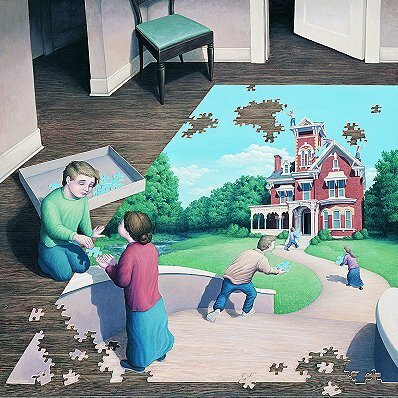 If I had to pick 1 it’s got to be jigsaw puzzle of the house being put together inside the house, very bizarre. Wallpaper sounds like a great idea. An absolutely astounding collection of artistry. 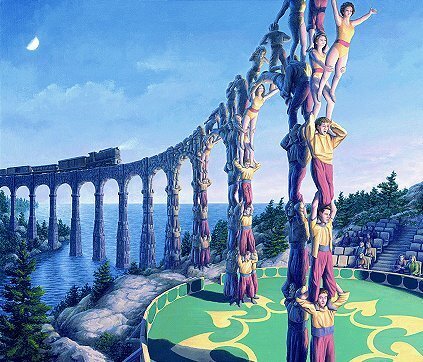 My favourite has to be the galleons materialising from the archways of the aquaduct, which, coincidentally, is the front cover of a book on optical illusions through the ages which I am currently reading. Inspiring work!! all of them r so amazing!!!!! Heres what my friend has 2 say…..
i think its awsome mate theres so much too it that makes yhoo think that its real and yhoo can do those things in real life “I WISH I COULD” againe awsome tell us how yhoo do it i want to now so i can draw it in school and show ma teacher LOL AMAZIN. GOOD JOB KEEP IT UP!!!!!!! 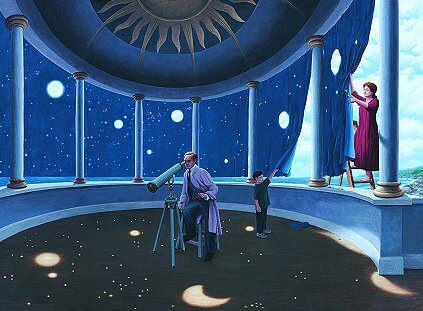 These paintings are sooooooooooo awsom. 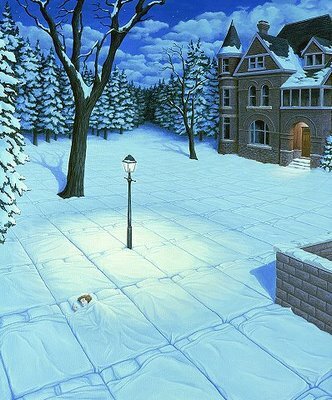 i would do anything to be able to paint like that!! The ships in the sky one is my favorite but I didn’t get the one with the boy treking through the snow. That was a fun visual, I wish there were more. These are absolutely brilliant! I especially like the ones that take you a moment to realise what is ‘wrong’ with the picture. 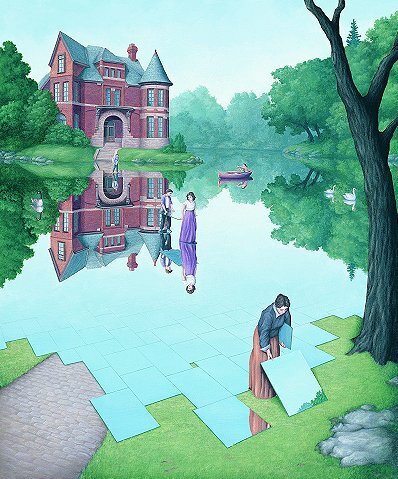 I’m really drawn to the one of the ‘lake’ made of mirrors, for some reason. And the ones where inhuman objects become human, they really show a different perspective. Rob Gonzalves is a mastermind. He shows us what the world could be like once the mind is freed of the mundane and normal causalities of our times. The mind has no limits, and the soul reaches forever. 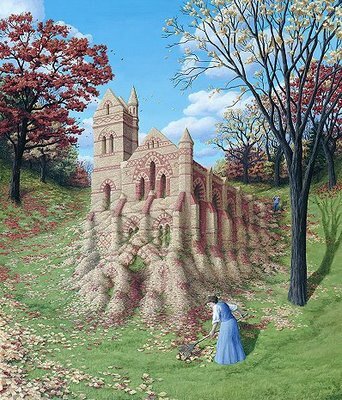 Very impressive works. Wow. Those are very imaginative. these pictures r fantastic!!!! I love these 1s: 1st one, 11th one, 12th one, 13th one, 15th one, 20th, 21st, 23th, and all the others!!!!! I would love 2 a talent like this!! 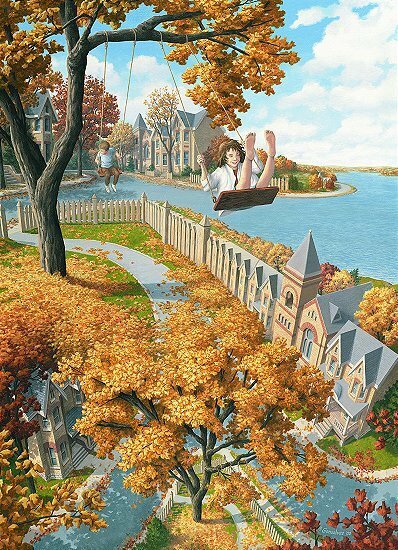 I personally love the Beach Room, the River monks, and the Girl flying off her bed. 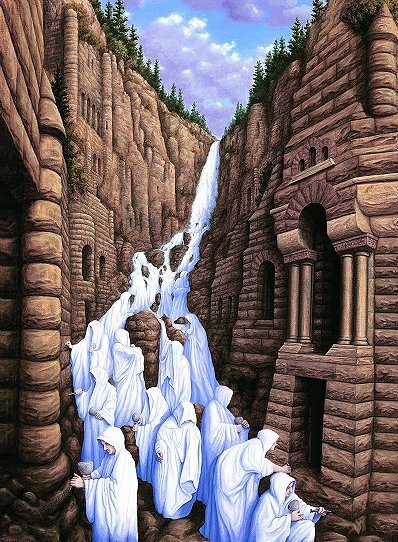 I wouldn’t say he’s better than Escher, because escher did a more mathmatical exploration, but this artist is very Escher like, in a good way. I’ve seen a lot of these paintings featured in books about illusions. Very cool. Cheers Vurdlak for such a cool site, I’ve been hooked through the widget since november and I’m loving every minute!! I like these, but they get really repetitive and I don’t really think their elusions. i love the one with the mirror lake! omgsh! i wish i was this insanely talented! OMG these paintings are something else man! You difinately have a very wild and vivid imagination. Way to go keep up the awesome art. I’ve seen a lot of those. the one with the books turning into doors is in my school library. My favourite one is the kids jumping on the beds. He is Sooooo Cool! I Wish He Could Make More! Stunning! Absolutely stunning! 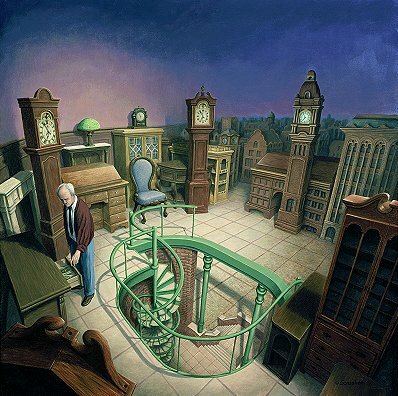 The transitions in these pics reminded me of the type of transitions that occur in dreams. I like the jigsaw world one best, because it’s the best-blended boundary and I like seeing the characters in the puzzle carrying the pieces through it, very impressive concept and execution. 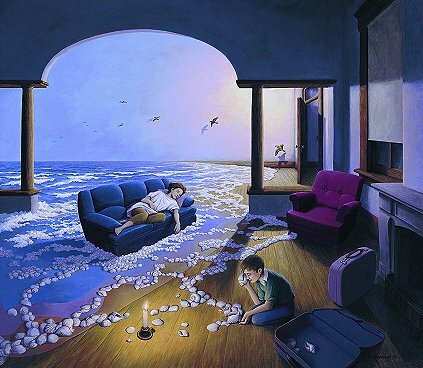 the most amazing paintings i have ever seen!! these were all in a book iv’e read before! amzaing! I like them all. My favorite it the third one from the top. the one woth the sunflower ladies. Thoses are totally awsome!~! *HEHE* they were mind blowing!~! These pictures are fascinating. They’re like peeking into someone else’s mind and watching his dreams. I hope there are more in our future. 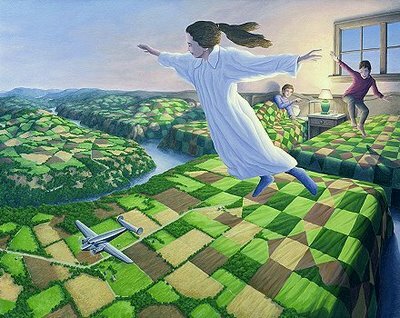 My favourite one is the children jumping on the beds and flying over the hills. 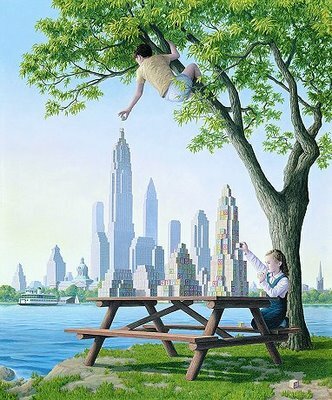 It is an amazing insight into a child’s mind and how anything can be anything with an imagination. 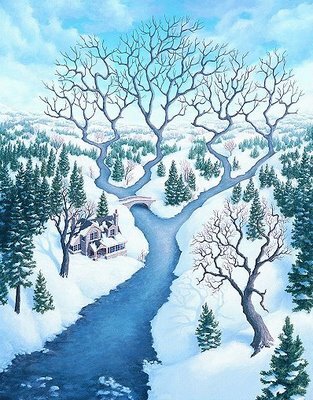 It flows perfectly between the situations and gives me a beautiful feeling. 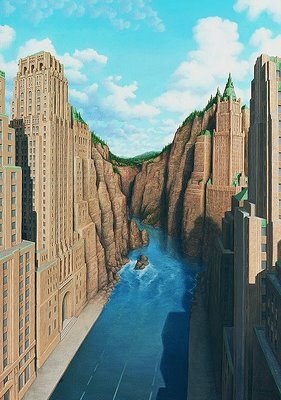 If a piece of artwork can do that it is truly amazing. These are from the books ‘Imagine a Day’, ‘Imagine a Night’ and others. 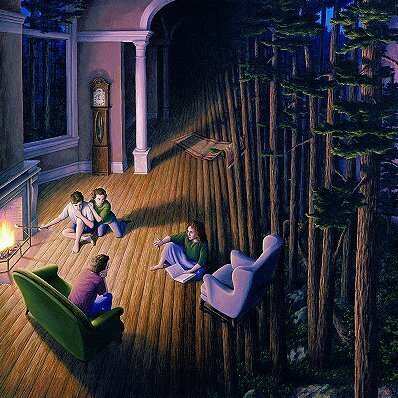 The sad thing is that most people will associate these meaningless displays of ILLUSTRATION with fine art. And assume that “he” is a ‘Great painter’ simply because the work is painted in a representational style. ‘realism” is the beginning of art, not the end result. The one i like the most is that women who is coming out of the water at night. i’ve seen it all before in a book but it will never get boring! SOOOOOOOOO cool! they are so artistic and lifelike! wish i could draw like that! Great! It must be wonderful to be able to put your imagination into play. 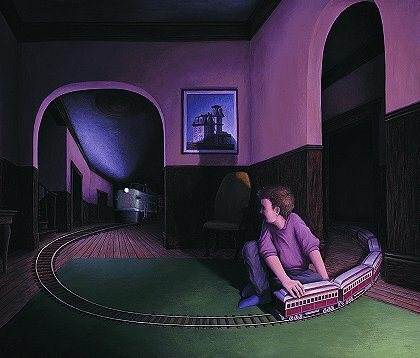 My favorites are the boy with the trains and the metaphoric picture of the library being a gateway to wherever you wish to go. these are all really awsome! Rob Gonsalves is one of my favourite illusion artists. way to go! 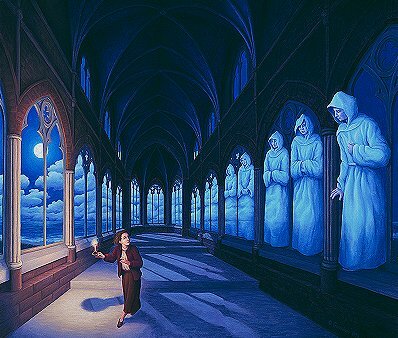 If you like illusions you should see the painting “christ of saint john” of Salvador Dali! 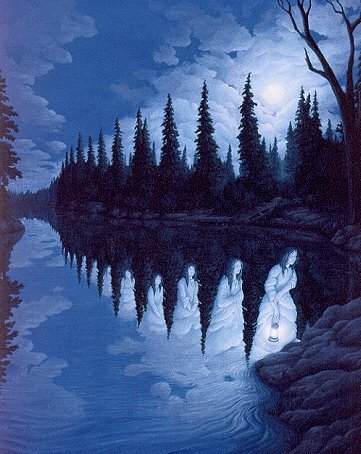 It’s a wonderfull painting and a beautifull illusion! Check it! 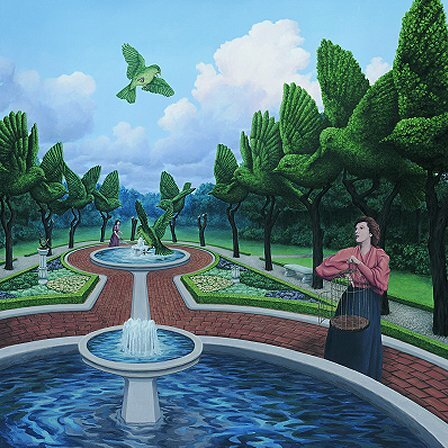 I love the sunflower ladies, the people coming out of the arches, the girl coming out of the water, the jigsaw, library, the waterfall turning into sculptors, the mirror lake and the second last one with the statues controlling the people like pupets. ThEsE ArE ThE MoSt BeAuTiFuL ThInGs I HaVe EvEr SeEn YaY PkiCtUrEs!!!!! Very beautiful. I had never heard of this person before, but now I’m a fan! 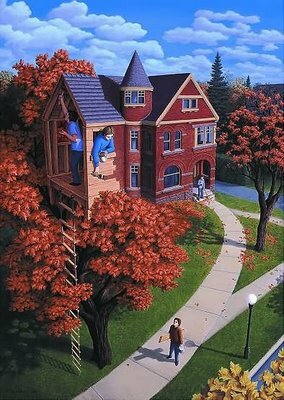 And Escher would be proud too. 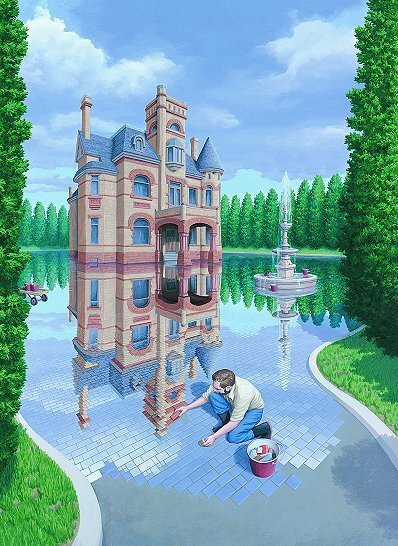 If you like these kind of illusions next time you’re in Holland visit the Escher Museum in The Hague. these are so awesome!!! LUV THEM ALL!!!! MORE PLEASE!!! 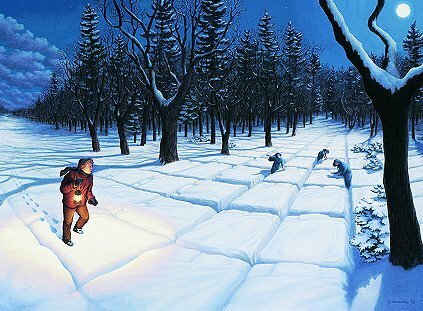 I love Rob Gonsalves work!! 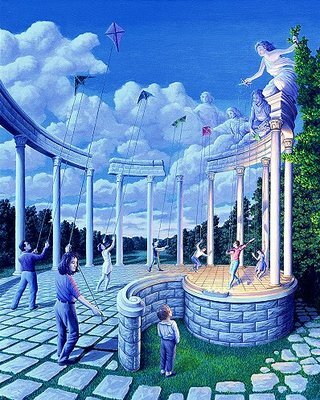 every picture amazes me.. 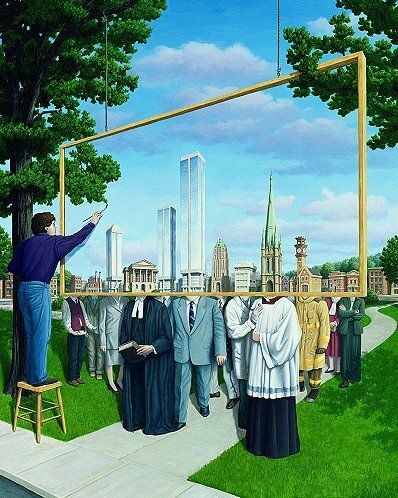 I find these pictures extremely thought provoking. I have no favorite, but the least impressive just need time to show their true genius…There are just too many to take in all at once. Superb. I remember reading this books when I was really little. They are so strange, but so beautiful! Wow these are so awesome!!!! 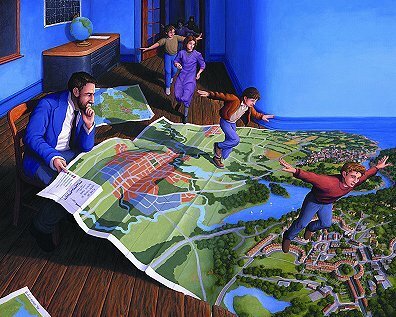 Very “Escher-like” and that is no small feat. I love this kind of work, it tickles your mind. 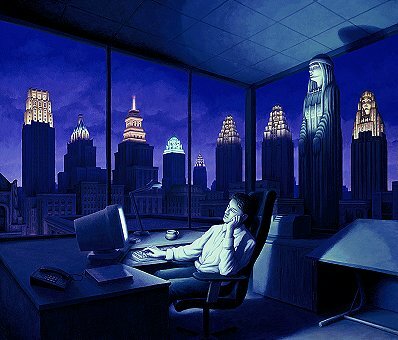 Very Magritte. I love it. THIS IS THE BEST!! I love it!! He is very creative. Love, love,love. 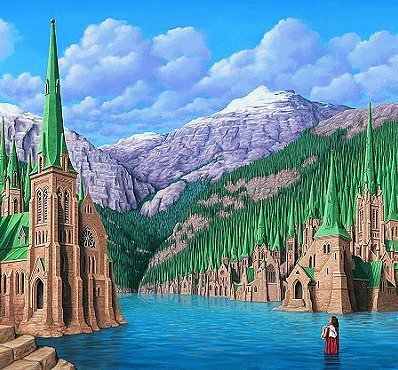 Words cant describe how much this is the coolest paintings ever. WOW!! i also found his homepage and visited it. his paintings are very creative and i love it. i can draw good but i dont know hot to draw like that. he has serious talent. Some of these are in a book called ‘Imagine a night’ or something like that. 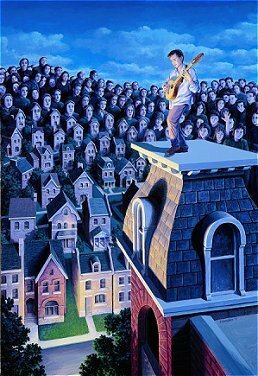 He writes several children books called imagine a day, and imagine a night and they have really cool captions. 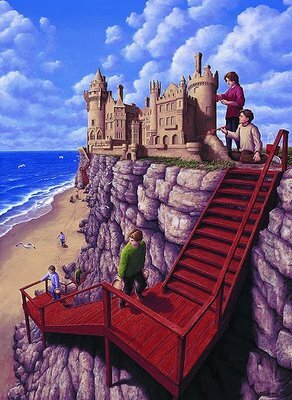 Mauritz Escher would be very proud of you. You are definitely taking his style one step further. 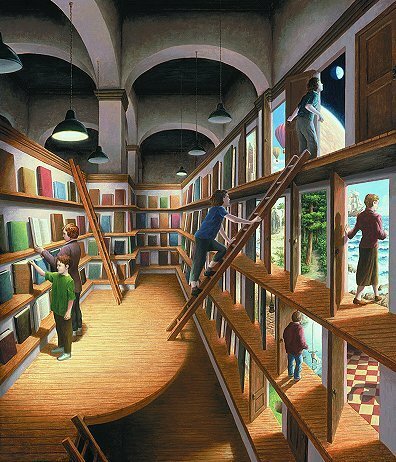 I have Escher’s book, and when your book is on print, I’ll order one. 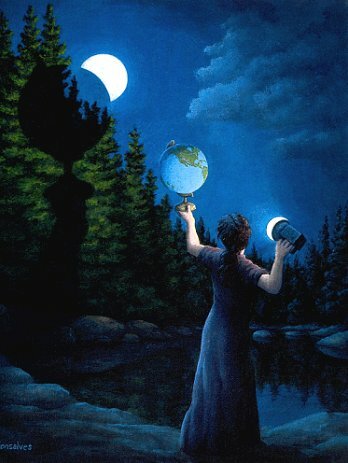 Wonderfull pictures; there is great idea (vision) in each and pictures are technically excelently produced. Great work! 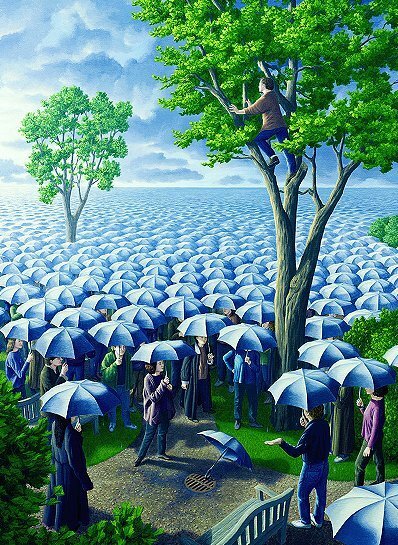 This is Aparna.I live in India and am an IB Student studying in grade 11.As a part of my comparative Studies in the subject Visual Arts I would like to take up the Artist Rob Gonsalves and his artworks as they really inspire me. Unfortunately,I am not acquired with the information required.Also I am not able to contact the Artist.I request you to kindly convey my regards to the Artist Rob Gonsalves and help me contact him by providing me with his Email ID.